How well does Fforde make the transition to children's fiction? Pretty well — once you realize that Last Dragonslayer is being miscategorized as young-adult fiction, which it clearly isn't. Jennifer's career in Mystical Arts Management is complicated by the fact that her boss, The Great Zambini, has disappeared leaving her in charge of forty-five wizards; the crumbling Zambini Towers; another indentured foundling, Horton "Tiger" Prawns; vast amounts of bureaucratic paperwork; and serious money troubles. She also has a pet Quarkbeast, which seems to be something between a dog, a piranha and an industrial garbage disposal, but with more teeth. Her already busy world is complicated when the Remarkable Kevin Zipp, a magical pre-cognitive at Kazam foresees the death of the last dragon, Maltcassion. Which may or may not have anything to do with the sudden surge in available magical power. There is both Old Magic and Big Magic (capitalization required) afoot. Jennifer, of course, is to be the Last Dragonslayer. Jennifer's a vegetarian, so the idea of offing a dragon is pretty distasteful to her. On the upside, she gets to drive a Rolls-Royce. There are more than a few parties interested in claiming the dragon's land once he dies. Jennifer's desire to avoid slaying the dragon is all that stands between a chunk of pristine moorland and environmental exploitation, being turned into a theme park or becoming a staging ground for a war with a neighboring Duchy. The plot, of course, is somewhat secondary to Fforde creating truly bizarre institutions like The Blessed Ladies of the Lobster, a convent that raises orphans for indentured servitude. And Consolidated Useful Stuff, a ubiquitous and ultimately evil corporation. Fforde cracks jokes about the absurdities of late market capitalism, television talk shows, and bureaucracy. The whole thing tumbles along with plenty of amusement and a few chase scenes. Like the Thursday Next novels, The Last Dragonslayer takes place in a post-war society, though this time it is the failed incursion into goblin lands and not a temporally delayed Crimean War. Tiger Prawns is a Troll War orphan, his father one of the "lost or eaten in action." This, as well as the pervasive economic troubles and the oppressive government of King Snodd, create a sort of down-at-heels, grimy backdrop for the magic. The book isn't dystopian at all, but certainly skirts along the edges of the popular sub-genre. The magic itself stays well within the realm of quirky, absurd and mundane. Fforde's mix of realism, humor, dragons and magic feels fresh, if skewed. Which is pretty much what you would expect from a Fforde novel. Unfortunately, the book is being stocked in the teen sections of most bookstores. As a straight-up YA novel, it fails on many counts. Jennifer's inner life is devoid of most of the emotion and search for identity found in most YA novels — though that may actually be a selling point. The plot is entirely externally driven, leaving Jennifer to play a role, but she doesn't often direct the action. And there are more than a few chapters devoted to people just explaining things. The book's moral framework is primarily simplistic, with everything depicted in stark black and white. If you think of Last Dragonslayer as a book for teens and young adults, its flaws tend to overwhelm its virtues, in fact. But Last Dragonslayer isn't a YA book, no matter what the marketing people think — but rather, a really solid entry into middle grade fiction. It fits remarkably well alongside middle grade classics like Patricia Wrede's Enchanted Forest Chronicles, or Philip Pullman's I Was a Rat. Psychological realism and tight plot structures aren't nearly as important in these types of books as complex world building, plots that subvert expectations, and just plain fun. And the book is fun. 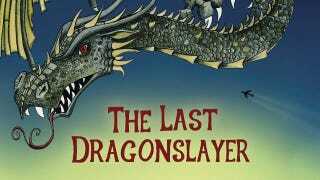 If you're looking for a book to delight an older middle grade reader or a fan of the Enchanted Forest Chronicles, The Last Dragonslayer is an excellent choice. Jennifer Strange's tale is a playful retelling of the dragon-vs.-knight story, filled with humor and warmth. Just don't give it to an older reader who's looking for something more emotionally or psychologically complex.